ReCAAP Information Sharing Centre (ISC) and World Maritime University (WMU) Monday signed a Memorandum of Understanding (MOU) to strengthen the cooperation between the two organisations in the shared interest in increasing the knowledge of the evolving situation of piracy and sea robbery in Asia. The cooperation will see ReCAAP ISC share its Asian experience in combating piracy and armed robbery against ships with the next generation of maritime leaders pursuing their postgraduate studies at WMU’s campus in Malmö, Sweden, and in turn host visiting students of WMU at ReCAAP ISC on their field studies to Singapore. The partnership will advance the United Nations Sustainable Development Agenda, in particular Goal 4 focused on education, Goal 7 related to energy, Goal 8 regarding decent work and economic growth, and Goal 16 promoting peaceful societies. “In 2015, ReCAAP ISC delivered the first lecture to students at WMU. Since then, both organisations have had useful mutual exchanges in the promotion of maritime safety and security as a vital topic for maritime leaders. 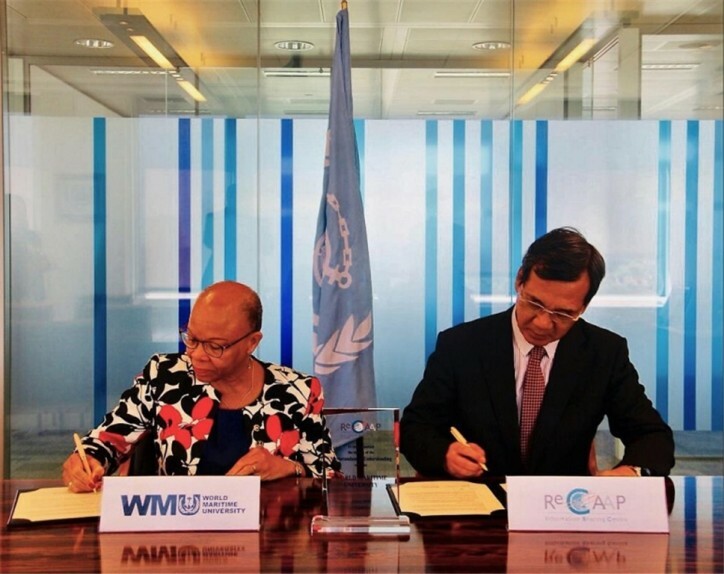 ReCAAP ISC highly appreciates WMU’s shared interest in having their students gain a better appreciation of the piracy and sea robbery situation in Asia, and this MOU provides a framework to deepen our mutual cooperation,” said Masafumi Kuroki, Executive Director of ReCAAP ISC.